Mobage/DeNA, the sucker of my time via collectible digital goods, has teamed up with Wizards of the Coast (and Hasbro) to release a game whose theme hits close to home: Dungeons and Dragons: Arena of War. 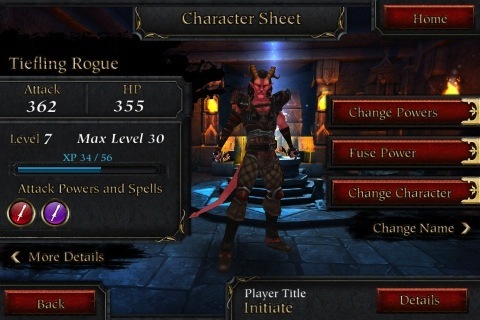 You have a stable of character classes that you are free to switch between and level independently. Each class is tied to a race already, so you don’t get too much customization other than changing the name and color of your skin and outfit. I began as the Elf Bard and got to level 2, but when I learned that the Elf Bard was not a requirement for unlocking any of the advanced classes, I switched to the Tiefling Rogue. 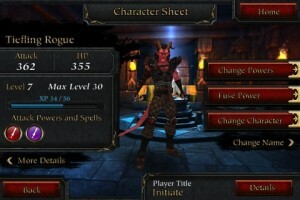 A Level 8 Tiefling Rogue is a prerequisite of two of the six advanced classes. Now if you have played Final Fantasy Airborne Brigade, then the “collection” and “power up” aspect is almost identical to that. 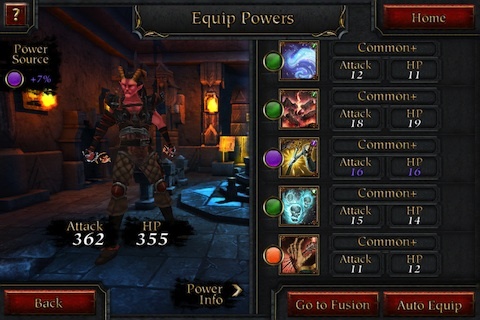 You collect powers, fuse them together and level them up. The powers have different rarities, and obviously the more rare the power, the stronger the power and more potential for growth it has. The powers all appear to be powers taken from the Player’s Handbook. 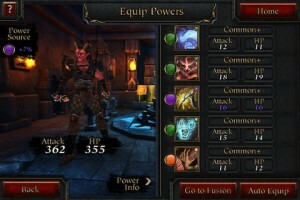 Powers simply add to the character’s health and attack. If the character class shares the same affinity with the power type, then there is a small boost to the added attack and HP. Multiple copies of a power can be fused together to increase the maximum level that the power can reach. Four copies of “Deft Strike” were combined to create the version above, and I’m waiting until I find a fifth copy to unlock its maximum level of 40. Other powers and scrolls can be fed into this power to increase its level, up to its max. So basically this is the typical Mobage cash-grab aspect, since you can only get up to “Rare” powers at best through free-to-play means, while “Rare+” and “Ultra Rare” and “Ultra Rare+” are found in purchasable treasure chests. A Level 1 UR is as strong as a maximum fused and leveled Common+ power, if not stronger. Next is the party. Dungeons are nearly impossible to clear by oneself, so you have to seek out help from friends. You pick two party members from your Friends list, which requires you to actually seek out friends. You need to seek out powerful friends who have invested a lot into their character in order to complete higher level maps. As of this writing, I’ve long since abandoned the game after unlocking 2 upper Tier classes. 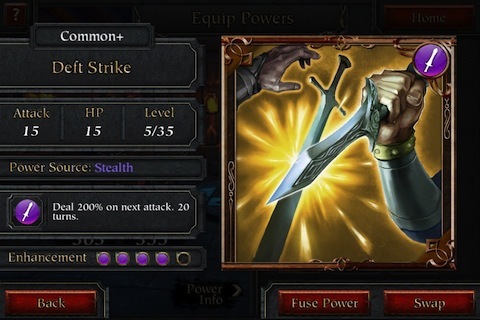 The tier 2 classes allow the equipping an additional power, which gives the character more versatility and more health and power. I’m participated in two events, which are nothing more than grinding for points for ranking and prizes, which gave me UR and UR+ powers. While I tend to enjoy these free-to-play, card-collecting-and-building games, D&D: Arena of War quickly grew stale because there was very little variety in the characters and powers, so much that I didn’t care about what I was collecting or building towards.